P2	P3	P5	P12 What are Natural Resource Charter precepts? Global interest in ownership transparency is growing, with the G8 adopting principles on beneficial ownership; a dozen EITI countries participating in a beneficial ownership pilot; and the US, UK and EU taking steps toward making more beneficial ownership information available. The aim of such initiatives is to shed light on secret ownership structures that enable some extractive companies to evade tax payments or hide improper relationships with government officials. 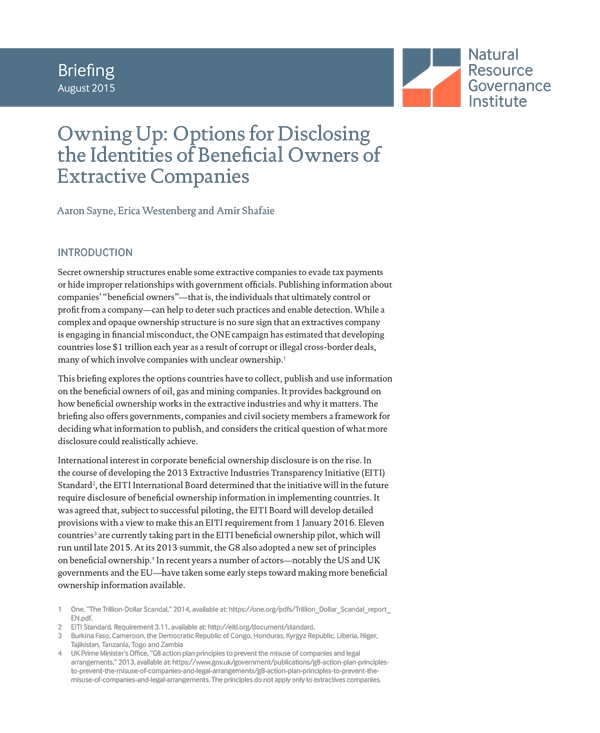 While a complex and opaque ownership structure is no sure sign that an extractives company is engaging in financial misconduct, the publication of beneficial ownership information can help to deter improper practices and enable detection. This briefing explores options open to countries for collecting, publishing and using information on the beneficial owners of oil, gas and mining companies. It provides background on how beneficial ownership works in the extractive industries and why it matters. The briefing also offers governments, companies and civil society members a framework for deciding what information to publish, and considers the critical question of what more disclosure could realistically achieve. Consider the rationale and scope for beneficial ownership disclosure. Decide which companies will be covered. Determine the level of disclosure required. Set mechanisms and timeframes for collecting the information. Find a workable method for confirming the information. Decide how to publish the information. Improve extractive sector governance based on monitoring of information.